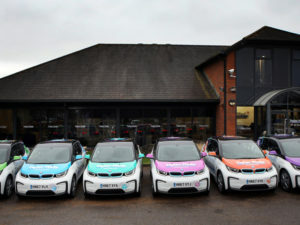 Taylor Made Computer Solutions has started to switch their fleet of 50 vehicles to electric, starting with the delivery of six new BMW i3. The new electric vehicles will be used as ‘pool cars’ for the company’s 115 employees, who also benefit from the use of three charge points at the comany’s Cams Hall Estate headquarters in Hampshire. Taylor Made says it plans to transition all 50 fleet vehicles to electric vehicles “in time”, despite the company saying their current fleet are already “relatively low emissions”.